I only had this beer once before at a Christmas Beer tasting at State Line Liquors. I love the funkiness of the Belgian Farmhouse Ales and this one had some added Christmas spices and higher in alcohol at 9.5% ABV. I can’t wait to see how it holds up under a full review, so let’s get this show on the road. It pours a cloudy pale copper almost a straw color with a bright white and fluffy head that seems like it will stick around a while. This ale is also highly carbonated; there are a tremendous amount of bubbles rising up from the bottom of the glass. The nose is very unique; Christmas spices of juniper and cinnamon along with sweet yeasty Belgian esters and volatiles escaping from the thick creamy head, with just a hint of that Belgian Funk. Oh, what a taste. It’s like Dupont Saison meets Christmas Cheer. It really is the best of the earthy farmhouse ale kicked up a notch for Christmas. The taste starts out with a malty sweetness and then you feel that high effervescence over the tongue, then the mouthfeel smoothes out with the creaminess of the head adding to the mouthfeel. Toward the backend of the taste you start to pick up the yeasty funkiness and earthiness of the saison. The finish is filled with Christmas spices and a fair amount of hops for a nice dry finish. There is no bitterness to the hop finish just a nice drying effect. This particular ale is a very unique Belgian. I’ve never had such a variance of Christmas spices and saison earthy and yeasty flavors all in the same sip. This is a very intriguing ale. The head has been reduced to a thick ¼ inch layer covering the top of the beer. This lingering head also adds to the creamy mouthfeel of the sip. This unique farmhouse ale is not for everyone. Well, I guess you could say that about any beer but this style has a very unique taste and funkiness to it that is not widely liked by everyone. The taste does not change as the beer warms. It is just a little less carbonated but other than that it really did not add or diminish any flavors. This is a very impressive Saison. I love the unique aspects of this Farmhouse Ale. 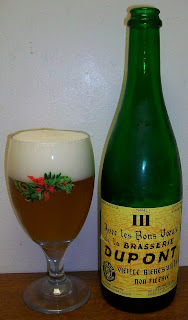 You do have the classic earthy and yeasty notes of a great saison plus the added spices of Christmas to make this a very unique and enjoyable ale. I highly recommend this bier to anyone that likes the funkiness of a Farmhouse ale plus this has the added spice that makes it an outstanding Christmas Saison Ale. A+ for this truly unique and enjoyable Christmas Saison.